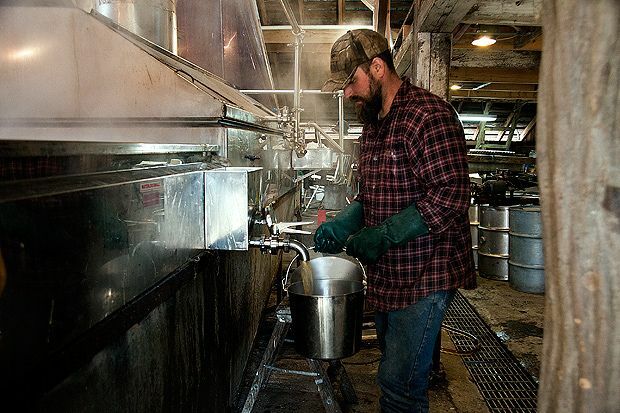 Today: Take a peek into how maple syrup is made. It's easy to take maple syrup for granted, to slather it with abandon onto pancakes, onto pork, onto anything. 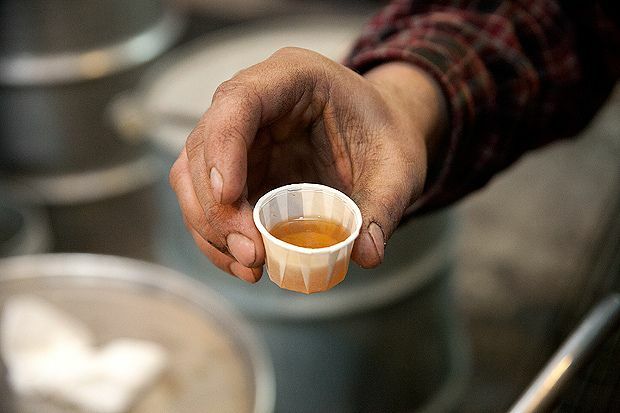 A maple syrup production farm is called a "sugarbush". 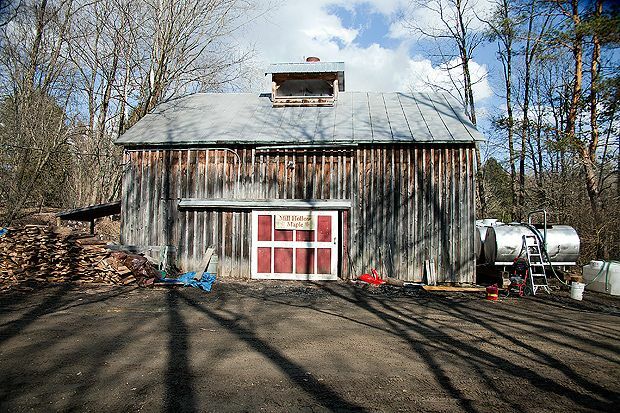 Here's the Mill Hollow Maple "sugar house", where maple sap is boiled down in a large metal evaporator to make syrup -- 1,800 gallons this year alone! 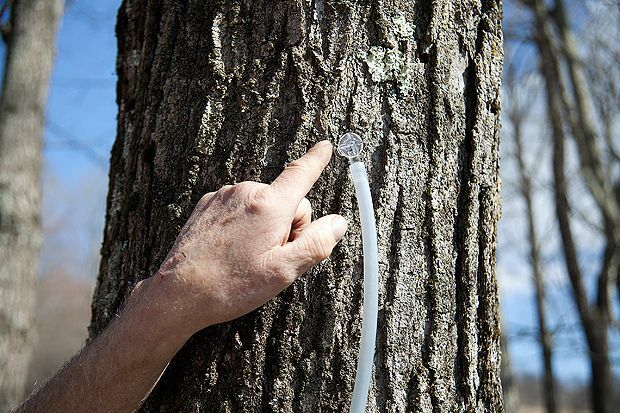 Sap is collected from the maple trees via a network of taps and plastic tubing. It takes about 4 weeks to drill the 6,000+ holes, starting in early January while the trees are still frozen. Here's a vacuum extractor, or a sap releaser. 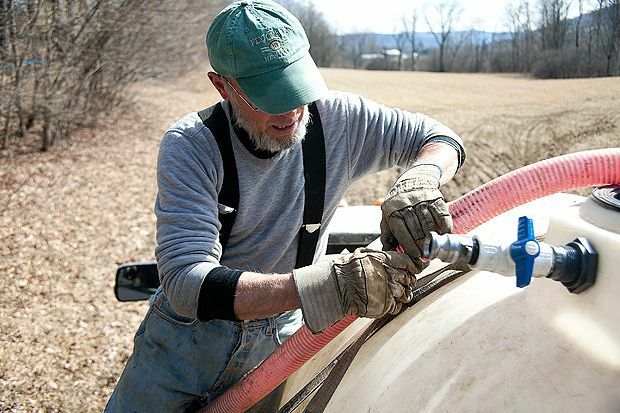 This device transfers the extracted sap into large central collection tanks. 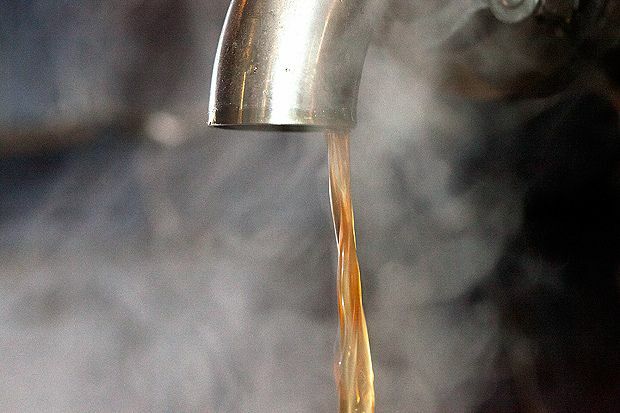 When the weather is just right -- 20s at night and 40s during the day -- the maple sap flows from the trees, through the infrastructure of tubes to the collection tanks. 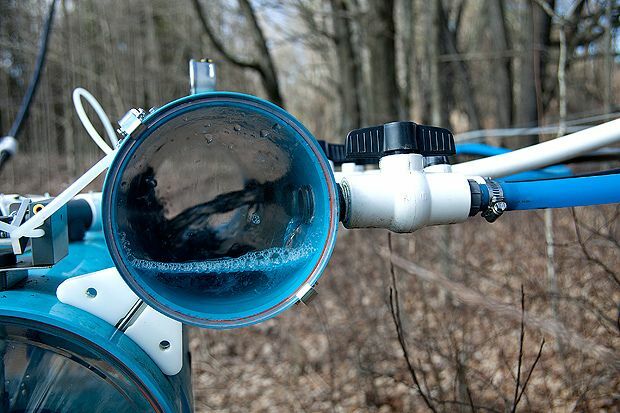 This season there were 30 days where the conditions were just right for the sap to flow. Here's Bruce with of the central collection tanks. These are placed at the bottom of the sugarbush, which allows the sap to flow down hill through the pipeline and into the tanks. 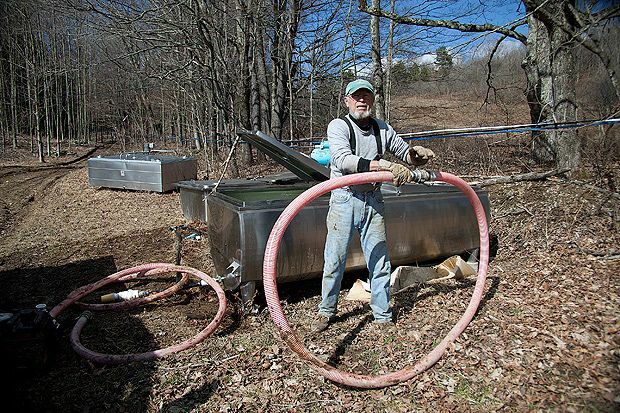 After the sap is collected, Bruce transfers it into a portable tank and brings it back to the sugar house. 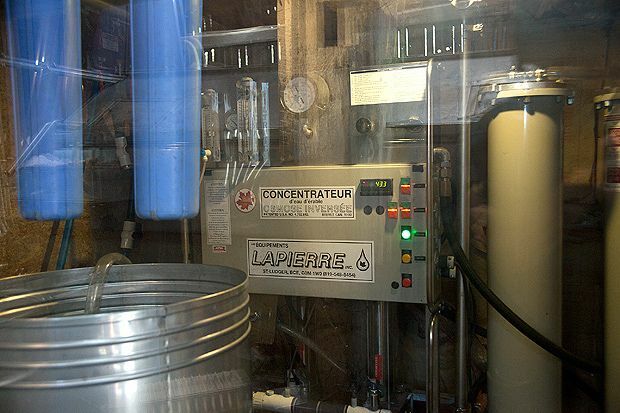 Inside the sugar house, this reverse osmosis machine is the first step in transforming the maple sap into syrup. It removes 80% of the water content -- and reduces the fuel consumption compared to older methods. Making all of this syrup takes a lot of fuel! Here's the staff loading wood fuel into a firebox underneath the evaporator. The fire must be kept above 800?F during the boil, so more wood must be added approximately every 10 minutes. 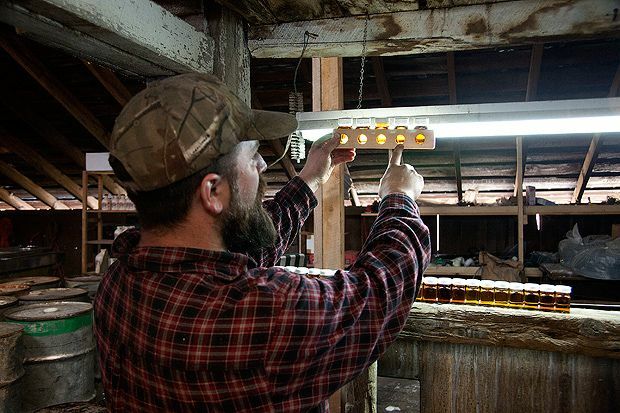 The whole process is extremely laborious and it takes between 20 and 50 liters of sap to make just one liter of maple syrup. Here's the "syrup pan." This is the final stage of evaporation. 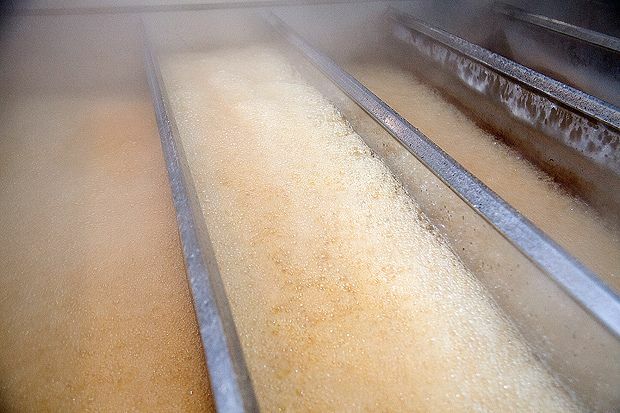 The syrup you see boiling is moments away from being the proper density that is considered proper maple syrup. This is a tightly-controlled process and is closely monitored to ensure an appropriate sugar content and a consistent quality. 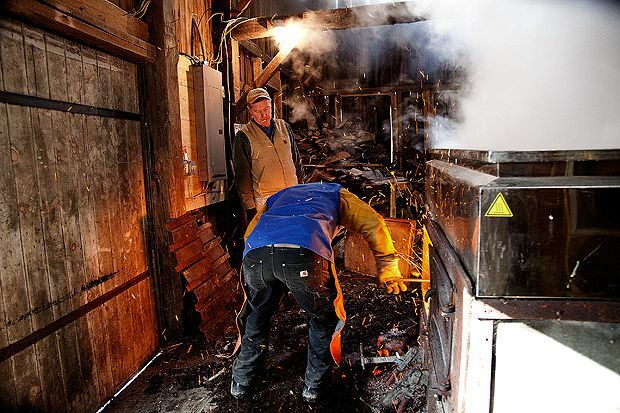 Here's Brian Ryther, the owner of Mill Hollow Maple, "drawing off" finished maple syrup out of the evaporator. See all that steam? The syrup is obtained at 7?F above the boiling point of water. And here's the finished product, which has been filtered and is ready to be graded and bottled. We have several places that make syrup in Indiana. One of the most interesting is a couple who moved here to grow shiitakes but instead wound up making a syrup called Shag Bark Hickory. It is a very old syrup cheat that Hoosiers have long used. You steep shagbark hickory bark in sugar syrup and reduce it like you would syrup. The flavor is one of a kind amazing! Hickory Works is the place that brought this method back to life. Very interesting,Tom. Thank you for mentioning.